So you've decided to get yourself a human being. In doing so, you've joined the millions of other cats who have acquired these strange and often frustrating creatures. There will be any number of times, during the course of your association with humans, when you will wonder why you have bothered to grace them with your presence. What's so great about humans, anyway? Why not just hang around with other cats? Our greatest philosophers have struggled with this question for centuries, but the answer is actually rather simple: THEY HAVE OPPOSABLE THUMBS. Which makes them the perfect tools for such tasks as opening doors, getting the lids off of cat food cans, changing television stations and other activities that we, despite our other obvious advantages, find difficult to do ourselves. True, chimps, orangutans and lemurs also have opposable thumbs, but they are nowhere as easy to train. 2. How and When to Get Your Human's Attention. Humans often erroneously assume that there are other, more important activities than taking care of your immediate needs, such as conducting business, spending time with their families or even sleeping. Though this is dreadfully inconvenient, you can make this work to your advantage by pestering your human at the moment it is the busiest. It is usually so flustered that it will do wh atever you want it to do, just to get you out of its hair. Not coincidentally, human teenagers follow this same practice. Here are some tried and true methods of getting your human to do what you want: Sitting on paper: An oldie but a goodie. If a human has paper in front of it, chances are good it's something they assume is more important than you. They will often offer you a snack to lure you away. Establish your supremacy over this wood pulp product at every opportunity. This practice also works well with computer keyboards, remote controls, car keys and small children. Waking your human at odd hours: A cat's "golden time" is between 3:30 and 4:30 in the morning. If you paw at your human's sleeping face during this time, you have a better than even chance that it will get up and, in an incoherent haze, do exactly what you want. You may actually have to scratch deep sleepers to get their attention; remember to vary the scratch site to keep the human from getting suspicious. 3. Punishing Your Human Being. Sometimes, despite your best training efforts, your human will stubbornly resist bending to your whim. In these extreme circumstances, you may have to punish your human. Obvious punishments, such as scratching furniture or eating household plants, are likely to backfire; the unsophisticated humans are likely to misinterpret the activities and then try to discipline YOU. The cat world is divided over the etiquette of presenting humans with the thoughtful gift of a recently disemboweled animal. Some believe that humans prefer these gifts already dead, while others maintain that humans enjoy a slowly expiring cricket or rodent just as much as we do, given their jumpy and playful movements in picking the creatures up after they've been presented. After much consideration of the human psyche, we recommend the following: cold blooded animals (large insects, frogs, lizards, garden snakes and the occasional earthworm) should be presented dead, while warm blooded animals (birds, rodents, your neighbour's chihuahua) are better still living. When you see the expression on your human's face, you'll know it's worth it. You are only obligated to your human for one of your lives. The other eight are up to you. We recommend mixing and matching, though in the end, most humans (at least the ones that are worth living with) are pretty much the same. Opposable thumbs will only take you so far. Outstanding thoughts and suggestions! 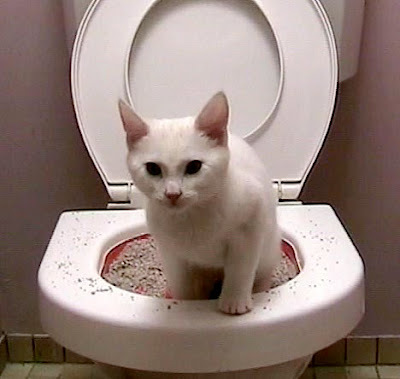 You might enjoy reading my how-to manual for cats, The World Is Your Litter Box, for even more ideas! Just loved reading this, and love the picture of the litter box loo. Aren't cats just the best ever? Oh my gosh! I had to hide this from my cats so they wouldn't try to use me for their convienience....um, wait a minute...when they woke me up at 4 a.m. to fill the food dish....heeyyyyy! i loved that last entry! very much appreciated for your kind comments dear friends, so sorry for my belated response, it's been such a long time to hibernate but I love your visit & comments:) make my day!